An artifact is a unique and unusually powerful magical item. Many of the artifacts in Skyrim have appeared in previous Elder Scrolls games, as listed at the Lore article on artifacts. For artifacts added by the Dragonborn add-on, see the Dragonborn Artifacts article. Only appear once in the game. Have a unique and useful enchantment. None of these artifacts can be disenchanted to learn the enchantment. Some of them may be improved by smithing. The material and perk relevant to each item is given below. Improving enchanted items requires the Arcane Blacksmith perk. However, many artifacts do not have an applicable perk that allows improvement past flawless quality without a Smithing skill of greater than 100. Many of the artifacts are of Daedric origin. These items are formed from the essence of a Daedric Prince, providing the items with their power. Nineteen Daedric Artifacts are available in the game; most are rewards for the Daedric Quests. 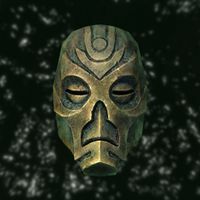 In addition to the Daedric artifacts, there are also other unique relics such as the masks worn by the undead Dragon Priests. There are nine of these scattered across Skyrim, each with unique powers and enchantments. This article only lists items that fit the definition of an artifact. For items that are leveled, see Leveled Items. For items that do not fit all of the requirements of an Artifact and are not leveled, see Unique Items. For unique items that are quest-related, see Quest Items. 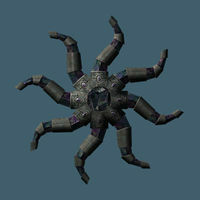 Summon a Dwarven Spider or Sphere for 60 seconds wherever the caster is pointing. 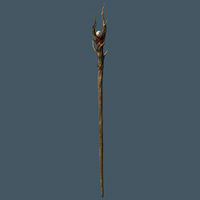 The Aetherial Staff is a staff created at the Aetherium Forge as one of three possible rewards for Lost to the Ages. 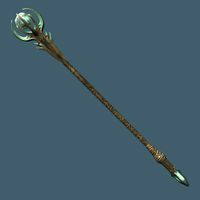 The appearance of the staff is similar to the Spider Control Rod, but with an aqua-blue crystal made of Aetherium. For more information, see the Aetherial Staff article. 20actually 10 points of sun damage. Undead targets take triple damage. Auriel's Bow is a powerful bow allegedly used by the elven god Auri-El. It is received from Gelebor during the quest Touching the Sky. Shooting the sun using Auriel's Bow with Bloodcursed Elven Arrows will block out the sun until the following morning, negating its negative effects on vampires for the duration. Additionally, shooting the sun with Sunhallowed Elven Arrows will cause the sun to shoot out rays of light at nearby enemies in a similar fashion to Storm Call. 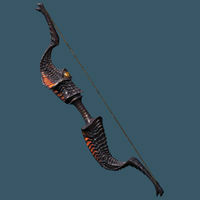 For more information, see the Auriel's Bow article. 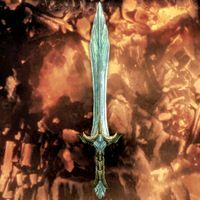 Chillrend is a unique glass sword found during The Pursuit in Mercer Frey's house in a display case with an expert-level lock. It deals frost damage as well as having a chance to paralyze anything it strikes. Tempering Chillrend requires one refined malachite and the Arcane Blacksmith perk, with the tempering being twice as effective if you have gained the Glass Smithing perk. It would be identical in appearance to a glass sword were it not for its blue hue. For more information, including leveled statistics, see the Chillrend article. Chrysamere is a greatsword artifact. 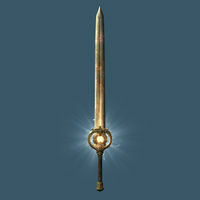 It is acquired through the The Lost Paladin quest, which has you claim the sword from the Lost Paladin at Forelhost. Its enchantment is unique among weapons, as it is defensive rather than offensive. Tempering Chrysamere requires an Ebony Ingot, a Ruby, and the Arcane Blacksmith perk. For more information, see the Chrysamere article. Dawnbreaker is a Daedric artifact given as a reward by Meridia upon the completion of her quest, The Break of Dawn. It can be improved using an ebony ingot. As well as dealing ten points of fire damage on every strike, Dawnbreaker has a chance to create a fiery explosion upon defeating undead. Any undead caught within the blast radius are set on fire and will flee from you. If you are a vampire, the blast will actually also harm and can potentially kill you. Undead killed by the explosion's fire will disintegrate upon death leaving behind an ash pile instead of a corpse. Light emanates from Dawnbreaker's cross-guard, an effect that is particularly pronounced in nighttime hours or in dungeons without illumination. For more information, see the Dawnbreaker article. 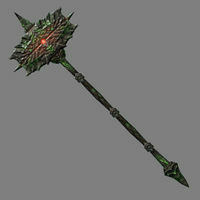 The Dawnguard Rune Axe is a powerful war axe received as part of the Lost Relic quest. 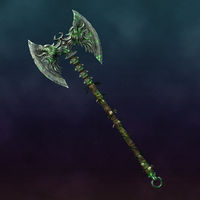 It is the only artifact in the game that is a war axe. Its enchantment does 10+n sun damage to undead where n is the number of undead killed since the last sunrise. Consequently, the enchantment becomes more powerful the more it is used. This axe can potentially be extremely powerful, as it does not require recharging with a soul gem, and also has an area of effect. This axe also instantly shatters any ward spells it hits. 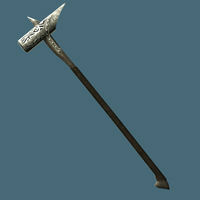 For more information, see the Dawnguard Rune Axe article. Bashing places a rune on a nearby surface; the rune explodes for 50 points of fire damage when enemies come near. 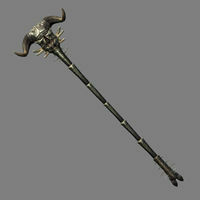 The Dawnguard Rune Hammer is a powerful warhammer received as part of the Lost Relic quest. Its enchantment gives you the unique defensive ability to create a Fire Rune by bashing with the hammer while aiming at the surface the rune is to be placed upon, however the range at which the rune can be placed is not particularly long. For more information, see the Dawnguard Rune Hammer article. 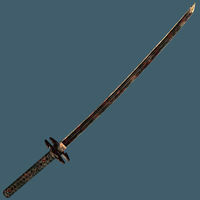 Dragonbane is an Akaviri katana found in Sky Haven Temple. As the name would suggest, Dragonbane does additional damage to dragons if used against them. The blade will do shock damage when used against other opponents instead, as suggested by its unique lightning effect. Tempering Dragonbane requires one quicksilver ingot and the Arcane Blacksmith perk, and the Steel Smithing perk makes tempering twice as effective. It cannot be broken down for its enchantments. For more information, including leveled statistics, see the Dragonbane article. Absorbs the life essence of your foes. Strengthened by the blood of deceit. The Ebony Blade is a Daedric artifact found during the quest The Whispering Door. 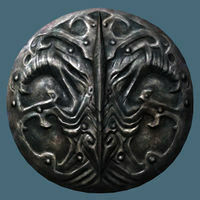 It is an artifact of the Daedric Prince Mephala. Essentially, it is a two-handed katana (with the speed, length, and reach of a standard, one-handed sword) with designs similar to normal ebony weapons. Upon obtaining the artifact, Mephala bids you to unlock the blade's true potential by murdering your close friends (typically, those you have done favors for). For every two such NPCs that are killed with the blade, Mephala will speak to you, and the blade's Absorb Health effect will increase by 4 points. After a total of ten people are betrayed, the absorb health effect will max out at 30 points per hit, and won't become any stronger. For more information, see the Ebony Blade article. Harkon's Sword is a one-handed sword carried by Lord Harkon. 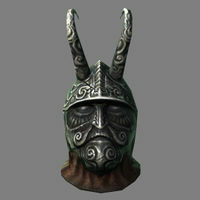 It can be acquired through either pickpocketing or by killing him when completing the Dawnguard add-on's main questline. 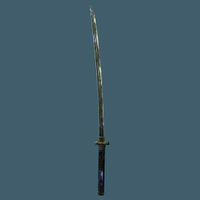 It is similar in appearance to a Blades katana, except that its guard has a unique shape and the handle is black. Its effect is unique in that its enchantment will only take effect if wielded by a vampire. For more information, see the Harkon's Sword article. 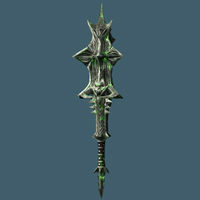 Keening is a unique dagger crafted by the Dwemer Lord Kagrenac. Keening, Sunder and Wraithguard are the three legendary tools created to control the Heart of Lorkhan. Arniel Gane, who is researching what happened to the Dwemer, had Keening brought to Skyrim during the quest Arniel's Endeavor. His goal is to use it in an experiment to finally solve the mystery of the Dwemer's disappearance. Before the completion of the quest Arniel's Endeavor, Keening has a "Mortal Wound" effect, lowering maximum health by 5 points as long as it is equipped. For more information, see the Keening article. 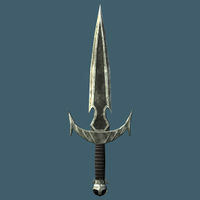 Mace of Molag Bal, also known as the Vampire's Mace, is one of Molag Bal's artifacts. It can be improved using an ebony ingot. Its enchantment drains its victims of twenty-five points of magicka and stamina with every strike. Its enchantment will also inflict its target with soul trap for three seconds. When walking around with the mace equipped, some NPCs may comment on it, saying: "That mace... get it away from me. Get it away..." or "No.. get that accursed mace away from me..."
For more information, see the Mace of Molag Bal article. The Mace of the Crusader is a mace artifact. It is acquired through the Relics of the Crusader quest, which has you claim the mace and other relics from the Bandit Thieves at the Four Skull Lookout. Tempering the Mace of the Crusader requires a Steel Ingot and the Arcane Blacksmith perk. For more information, see the Mace of the Crusader article. Mehrunes' Razor is a dagger and a Daedric artifact crafted by Mehrunes Dagon that has the chance to instantly kill any opponent. 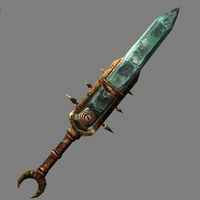 Even without the disintegrate armor effect from its Oblivion counterpart, it is a very powerful dagger. The damage dealt is equal to an unenchanted Daedric dagger while weighing half as much. 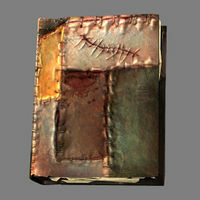 It is received after the quest Pieces of the Past if the demands of Mehrunes Dagon are met and Silus Vesuius is killed. The dagger can be tempered using an ebony ingot; however, the dagger does not benefit from any Smithing perks (See Bugs section). For more information, see the Mehrunes' Razor article. Absorb 25 points of health and 25 points of stamina per second from the target. The Nightingale Blade is a sword, originally owned by Gallus, given to you by Karliah during the quest Hard Answers. Its enchantment absorbs the health and stamina of whoever is slashed by it for one second. Tempering the Nightingale Blade requires one ebony ingot and the Arcane Blacksmith perk. 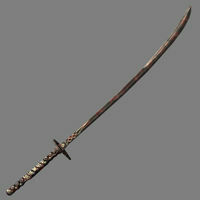 The sword itself is similar in color to ebony, with the Nightingale insignia engraved on the guard. For more information, including leveled statistics, see the Nightingale Blade article. 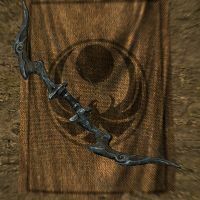 The Nightingale Bow is a bow given to you by Karliah as a reward for completing the quest Blindsighted. Its enchantment causes instantaneous frost damage, shock damage over one second, and slows the target down for three seconds. Tempering the Nightingale Bow requires one ebony ingot and the Arcane Blacksmith perk. For more information, including leveled statistics, see the Nightingale Bow article. 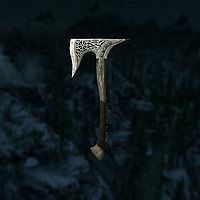 The Rueful Axe is a unique battleaxe. 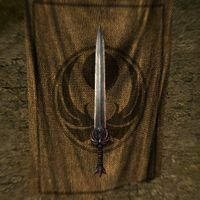 It is found in the possession of Sebastian Lort during the quest A Daedra's Best Friend, and may be given to you as a reward from Clavicus Vile for the murder of Barbas. Randomly applies one of these effects to the target: Frost, Demoralize, Frenzy, Drain Magicka, Paralyze. Ruin's Edge is a bow artifact with an animated eyeball just above the grip. 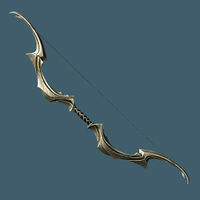 It is acquired through the The Edge of Ruin quest, which has you claim the bow from bandits in Stony Creek Cave. Its enchantment applies a random effect. Tempering Ruin's Edge requires a Daedra Heart, the Daedric Smithing perk, and the Arcane Blacksmith perk. For more information, see the Ruin's Edge article. Sanguine Rose is a staff received after winning a drinking contest with Sam Guevenne in A Night To Remember, or at least after you put together what happened the night before and find him again. It will summon a Dremora to aid in your fights for 60 seconds. For more information, see the Sanguine Rose article. Target is 15% weaker to magic for 30 seconds. Shadowrend is an artifact that can take the form of a greatsword or battleaxe. You find it in Eastmarch switching back and forth in form. To take it and complete the quest Through a Glass, Darkly, you must defeat your shadow. The weapon can be switched out for the other form anytime at the location you found it. Shadowrend's enchantment makes the target temporarily weaker to magic. Tempering Shadowrend requires an Ebony Ingot and the Arcane Blacksmith perk. For more information, see the Shadowrend article. The Skull of Corruption is a dream-powered staff given by Vaermina as a reward for completing the Waking Nightmare quest in Dawnstar. To Dreamsteal, you simply cast it on a sleeping person and it will collect their dreams; however, it will still need to be charged with soul gems as well. If equipped, guards will make comments about the staff: "What manner of staff is that? Such a horror..." and "What a foul and unnatural weapon you wield. Never have I seen its like." The staff should never harm a sleeping NPC. Both of the damaging components of the enchantment, Waking Nightmare and Psychic Agony, affect only targets who are awake. Once cast on a sleeping NPC, that NPC gains the Dreamsteal active effect for 43,200 seconds (12 hours). While they have this effect, Dreamsteal won't work on them again. The Dreamsteal component also has neither the Detrimental nor Hostile flags checked, and has No Hit Event and Painless, and therefore should be considered non-hostile by witnesses. Dreamsteal stores five dreams per valid target and expends one stored dream per hostile firing. Psychic Agony, the base damaging component of the enchantment, only functions while the staff contains no stored dreams. Therefore, only Waking Nightmare or Psychic Agony can take effect from a single shot, not both. For more information, see the Skull of Corruption article. Absorb 20 magicka per second. If the target is out of magicka, absorb health instead. 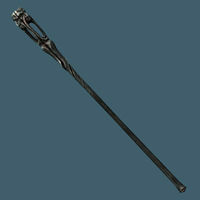 The Staff of Magnus is a unique item in its appearance and functions similarly to the staves of flames, frost, and sparks, which all feature a constant firing when used until their charge is depleted. When fired, the Staff of Magnus emits a stream of energy that has a significantly larger range than other forms of concentration spells (i.e. Flames, Sparks, Frostbite), excluding the master-level Destruction spell Lightning Storm. The staff has an unusually large charge capacity and features a unique effect of draining 20 points of magicka per second from its target and will start draining health instead if the target has no magicka, so it is particularly useful against high level mages like Master Necromancers. For more information, see the Staff of Magnus article. The Staff of Sheogorath is an artifact of the Daedric Prince Sheogorath, which can be obtained through the quest Put A Fork In It. 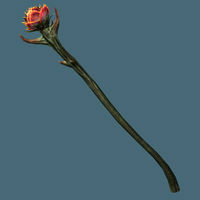 The staff is able to paralyze any targets who fail to resist its area of effect. For more information, see the Staff of Sheogorath article. Stendarr's Hammer is a unique Warhammer associated with the deity Stendarr. 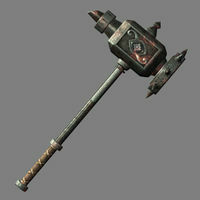 The hammer is acquired through a quest which involves stealing it from the Dwemer Museum in Markarth. Its enchantment causes respectable damage to the target, but drains stamina from its wielder. Tempering Stendarr's Hammer requires an ebony ingot, a flawless sapphire, and the Arcane Blacksmithing perk. It is particularly notable for its extreme weight (slightly more than three times the weight of a Dragonbone Warhammer,DG which has the same base damage), giving it an incredible power attack stamina cost in addition to its base Stamina cost enchantment. For more information, see the Stendarr's Hammer article. The Sword of the Crusader is a Sword artifact. It is acquired through the Relics of the Crusader quest, which has you claim the sword and other relics from the Bandit Thieves at the Four Skull Lookout. Tempering the Sword of the Crusader requires a Steel Ingot and the Arcane Blacksmith perk. For more information, see the Sword of the Crusader article. 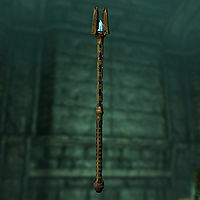 Volendrung, also known as the Hammer of Might, is said to have been created by the Dwemer of the now-abandoned clan of Rourken, hundreds of years before they disappeared from Tamriel. Like the dwarves who created it, Volendrung is prone to disappearing suddenly. Unlike the Dwemer, Volendrung is also prone to resurfacing unexpectedly. It is the reward for completing Malacath's daedric quest, The Cursed Tribe. It can be tempered with an ebony ingot. Its swing speed is faster than other warhammers (the same speed as battleaxes and greatswords). It is the second fastest warhammer in the game, after the Longhammer, which is the fastest two-handed weapon in the game. For more information, see the Volendrung article. Wabbajack is a Daedric artifact given to you by Sheogorath in The Mind of Madness quest. The staff applies a variety of random effects on the target it is used against. It can randomly cause fire, frost, or shock damage, absorb health, make the target invisible, heal the target, and in some cases instantly kill the target. Along with its offensive abilities it can also randomly transform a target into a chicken, rabbit, mudcrab, Dremora or very rarely a sweet roll or a bottle of wine, or even more rarely into a shower of gold coins. Transforming the target into a sweet roll or gold coins usually terminates the target. However, if the Wabbajack is used to transform a target into an animal, it only delays the fight as they often transform back a short time later with full health (using it on the same target will return them to their true form where the fight can continue as normal). For more information, see the Wabbajack article. 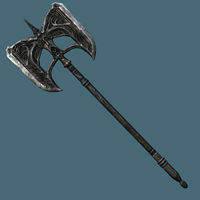 Wuuthrad is an ancient battleaxe once wielded by the founder of the Companions, Ysgramor. Ysgramor carried the axe when he and the Five Hundred Companions drove the elves from Skyrim and Solstheim. For historical information about Wuuthrad, see the lore article. Its primary effect is causing 1.2x damage to elves, namely Altmer, Bosmer, Dunmer, and Falmer. Accordingly, the visage of a screaming elf decorates the axe. At the start of the game, Wuuthrad is in several fragments, four of which are located within the Companions headquarters Jorrvaskr. 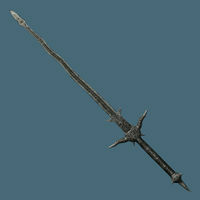 During the course of the Companions quest line, the weapon is reforged and is used to gain access to Ysgramor's tomb. After placing Wuuthrad into the hands of Ysgramor's statue at the entrance of his tomb, you can take it back straight away and continue along without affecting the rest of the quest. You can use it as you see fit, though it is no longer a quest item and so has a weight. Wuuthrad can not be improved by smithing, though it can be enchanted. Despite this, the effect text doesn't change, which means you cannot see how much damage the enchantment does. You can still modify the amount. For more information, see the Wuuthrad article. 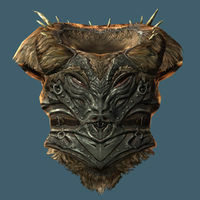 Hevnoraak is an iron dragon priest mask gained by killing Hevnoraak within the Nordic Ruin of Valthume. The enchantment provides poison and disease immunity for all diseases and poisons except for ones that ignore disease and poison resistance. It can be improved with iron ingots. For more information, see the Hevnoraak article. Konahrik is a golden dragon priest mask gained by obtaining all other masks from the base game and bringing them to Bromjunaar Sanctuary. The artifact's enchantment has a chance to trigger a variety of effects when the wearer's health is reduced below 15%. Most commonly, it restores a large portion of the wearer's health. In addition to the first effect, it can also provide you with a Flame Cloak lasting for 15 seconds. Very rarely, the mask can summon a spectral dragon priest that will aid you in combat for 60 seconds. Konahrik can be improved with gold ingots. For more information, see the Konahrik article. 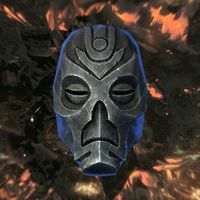 Krosis is a bronze dragon priest mask gained by killing the eponymous Krosis upon Shearpoint, a dragon lair. The mask's enchantment improves the user's Alchemy, Archery, and Lockpicking skills by twenty points. It can be improved with iron ingots. For more information, see the Krosis article. 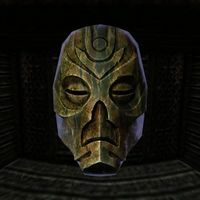 Morokei is a moonstone dragon priest mask gained by killing Morokei within Labyrinthian. The mask's enchantment doubles magicka regeneration. It can be improved with refined moonstone. For more information, see the Morokei article. Nahkriin is an ebony dragon priest mask obtained by killing the eponymous Nahkriin, who is encountered during the main quest at Skuldafn. It is imbued with an enchantment that grants the wearer a Fortify Magicka effect that gives the wearer an additional fifty points of magicka. The enchantment also decreases the cost of spells in the Destruction and Restoration schools by twenty percent, due to its Fortify Destruction and Fortify Restoration effect. It can be tempered with ebony ingots. For more information, see the Nahkriin article. 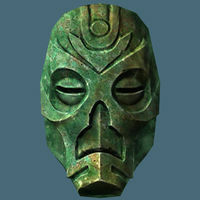 Otar is a malachite dragon priest mask obtained by killing the eponymous Otar the Mad within the Nordic ruin, Ragnvald. The artifact's enchantment grants 30 points of shock, fire, and frost resistance. It can be tempered with refined malachite. For more information, see the Otar article. 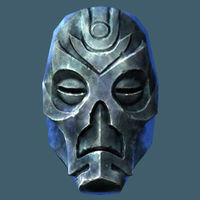 Rahgot is an orichalcum dragon priest mask obtained by killing the eponymous Rahgot within the Nordic ruin, Forelhost. The artifact's enchantment increases your stamina by 70 points. It can be tempered with orichalcum ingots. For more information, see the Rahgot article. 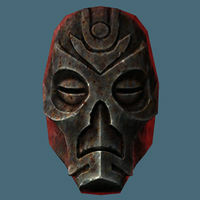 Vokun is a steel dragon priest mask obtained by killing the eponymous Vokun within High Gate Ruins. The artifact's enchantments increase your Alteration, Conjuration, and Illusion skills by twenty points when worn. It can be tempered with steel ingots. For more information, see the Vokun article. Volsung is a corundum dragon priest mask obtained by killing the eponymous Volsung at the end of the Nordic ruin, Volskygge. The artifact's enchantment allows you to breathe underwater, carry an additional twenty units of weight, and increases your bartering abilities by twenty points. It can be tempered with corundum ingots. For more information, see the Volsung article. The Wooden Mask is a dragon priest mask found at Labyrinthian alongside a long-forgotten note. It is enchanted with an effect named Bromjunaar's Mystery that causes the wearer to be teleported backwards in time to Bromjunaar Sanctuary. The special effect only works if the mask is equipped while inside of the ruined building outside of Labyrinthian where the mask is initially found. While not being particularly useful outside of Labyrinthian, it is necessary to unlock Konahrik. For more information, see the Wooden Mask article. 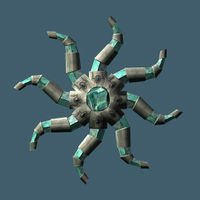 Retains the last Standing Stone ability you held, granting you its effects in addition to those of your current Stone. The Aetherial Crown is created at the Aetherium Forge as one of three possible rewards for Lost to the Ages. It retains your previous Standing Stone power whenever you choose a new one, meaning that while you wear it, you can have two Standing Stone powers active at the same time. For more information, see the Aetherial Crown article. The Aetherial Shield is made at the Aetherium Forge as one of three possible rewards for Lost to the Ages. It turns enemies ethereal for 15 seconds when bashed so they cannot be harmed or harm you, and also causes them to flee in fear. For more information, see the Aetherial Shield article. The Archmage's Robes are a set of hooded robes that are awarded to you after completing The Eye of Magnus. They provide boosts to all magic based skills except Enchanting, plus bonuses to magicka and magicka regeneration. For more information, see the Archmage's Robes article. Stores the energy of blocked attacks. Performing a power bash will release the stored energy. Auriel's Shield is a powerful shield allegedly created and used by the elven god Auri-El. It can be found wielded by a Falmer Warmonger in the Forgotten Vale Forest after using the Ruby Paragon on the paragon portal. After 5 successful blocks, the shield will start glowing and a shockwave can be released by power bashing, which becomes stronger with each 5 blocked attacks. After 15 blocked attacks, the shield is fully charged and the shockwave is similar to the effect of the Unrelenting Force shout. For more information, see the Auriel's Shield article. The Boots of the Crusader are artifact boots. They are acquired through the Relics of the Crusader quest, in which you also claim the other relics from the Bandit Thieves at Four Skull Lookout. Improving the Boots of the Crusader requires a Corundum Ingot and the Arcane Blacksmith perk. For more information, see the Boots of the Crusader article. 10% Armor bonus, and 10% reduced damage from undead while wearing matched set. Increase your health by 10 points. Restoration spells cost 8% less to cast. The Cuirass of the Crusader is an artifact cuirass. It is acquired through the Relics of the Crusader quest, in which you also claim the other relics from the Bandit Thieves at Four Skull Lookout. Improving the Cuirass of the Crusader requires a Corundum Ingot and the Arcane Blacksmith perk. For more information, see the Cuirass of the Crusader article. Restoration spells cost 8% less to cast. Increases Disease Resistance by 50%. The Gauntlets of the Crusader are artifact gauntlets. They are acquired through the Relics of the Crusader quest, in which you also claim the other relics from the Bandit Thieves at Four Skull Lookout. Improving the Gauntlets of the Crusader requires a Corundum Ingot and the Arcane Blacksmith perk. For more information, see the Gauntlets of the Crusader article. Illusion spells cost 10% less to cast. Restoration spells cost 8% less to cast. Prices are 8% better. The Helm of the Crusader is an artifact helmet. It is acquired through the Relics of the Crusader quest, in which you also claim the other relics from the Bandit Thieves at Four Skull Lookout. Improving the Helm of the Crusader requires a Corundum Ingot and the Arcane Blacksmith perk. For more information, see the Helm of the Crusader article. The Shield of the Crusader is an artifact shield. It is acquired through the Relics of the Crusader quest, in which you also claim the other relics from the Bandit Thieves at Four Skull Lookout. Improving the Shield of the Crusader requires a Corundum Ingot and the Arcane Blacksmith perk. For more information, see the Shield of the Crusader article. The Reforged Boots of the Crusader are an artifact boots. They are acquired through the Relics of the Crusader quest, in which you also claim the other relics from the Bandit Thieves at Four Skull Lookout. Improving the Reforged Boots of the Crusader requires a Corundum Ingot and the Arcane Blacksmith perk. For more information, see the Reforged Boots of the Crusader article. The Reforged Cuirass of the Crusader is an artifact cuirass. It is acquired through the Relics of the Crusader quest, in which you also claim the other relics from the Bandit Thieves at Four Skull Lookout. Improving the Reforged Cuirass of the Crusader requires a Corundum Ingot and the Arcane Blacksmith perk. For more information, see the Reforged Cuirass of the Crusader article. The Reforged Gauntlets of the Crusader are an artifact gauntlets. They are acquired through the Relics of the Crusader quest, in which you also claim the other relics from the Bandit Thieves at Four Skull Lookout. Improving the Reforged Gauntlets of the Crusader requires a Corundum Ingot and the Arcane Blacksmith perk. For more information, see the Reforged Gauntlets of the Crusader article. The Reforged Helm of the Crusader is an artifact Helmet. It is acquired through the Relics of the Crusader quest, in which you also claim the other relics from the Bandit Thieves at Four Skull Lookout. Improving the Reforged Helm of the Crusader requires a Corundum Ingot and the Arcane Blacksmith perk. For more information, see the Reforged Helm of the Crusader article. The Fastened Shield of the Crusader is an artifact. It is acquired through the Relics of the Crusader quest, in which you also claim the other relics from the Bandit Thieves at Four Skull Lookout. Improving the Fastened Shield of the Crusader requires a Corundum Ingot and the Arcane Blacksmith perk. 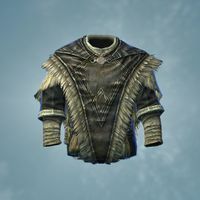 The Fastened Shield of the Crusader is not actually a shield; rather, it is the only item in the game to utilize the "shoulder" equipment slot. As such, it can simply be equipped for an additional armor boost without affecting any of your other gear. Notably, it does not negate the Mage Armor perk. For more information, see the Fastened Shield of the Crusader article. +10 Bash damage against vampires, and sustained blocking creates a minor sun shield doing 10 points of damage while draining the wielder's stamina. 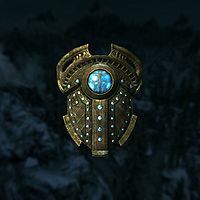 The Dawnguard Rune Shield is a powerful shield received as part of the Lost Relic quest. When you block with this shield, an aura similar to Stendarr's Aura will appear around you that does harm to undead. For more information, see the Dawnguard Rune Shield article. You are able to move more quietly, and opponents that get too close take 5 points poison damage per second. The Ebony Mail is an artifact created by the Daedric Prince Boethiah. It is heavy armor and enchanted with a muffle effect as well as a unique area effect that inflicts 5 points of poison damage per second on the health of nearby opponents. It can be improved with an ebony ingot. It is awarded to you by Boethiah for completing the quest Boethiah's Calling. 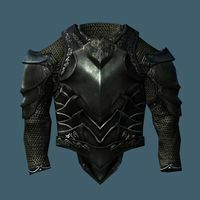 In appearance, the Ebony Mail is not too different from ordinary ebony armor, aside from the absence of shoulder pauldrons, a black chainmail texture replacing the cloth areas, and minor color changes. 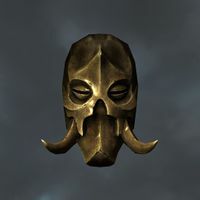 The most unique feature of the Ebony Mail is its "poison cloak" enchantment, which activates when the wearer is sneaking or when an enemy is nearby. While active, the armor gives off a black/green-colored smoke and all parts of the wearer (including weapons but not hair and facial hair) appear a shadowy black. Most hostile creatures or NPCs affected by the poison cloak will take on a similar silhouetted appearance. For more information, see the Ebony Mail article. 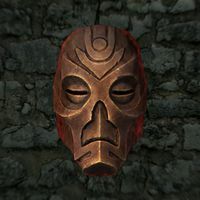 The Masque of Clavicus Vile is a Daedric artifact created by Clavicus Vile that will gain you the respect and admiration of everyone who meets you. 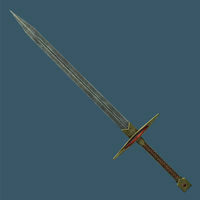 It is given as a reward for returning the Rueful Axe to Clavicus Vile during the quest A Daedra's Best Friend. For more information, see the Masque of Clavicus Vile article. The Necromancer Amulet is a legendary artifact created by the King of Worms, Mannimarco. The wearer becomes wise beyond their years and far more capable in the School of Conjuration. The amulet is unstable in this world, and is forever doomed to fade in and out of existence, reappearing at locations distant from that of its disappearance. A Strange Amulet is found when investigating the recent murders in Windhelm during the quest Blood on the Ice in Hjerim, the home of Friga Shatter-Shield. When speaking to Calixto Corrium about the amulet he says it is the Wheelstone, an amulet traditionally carried by court mages of the Jarl of Windhelm, and offers to buy it for 500 gold. Either talking to Wuunferth the Unliving or accusing him of being the Butcher reveals it to be the Necromancer's Amulet of legend. 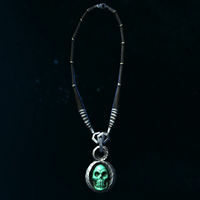 For more information, see the Necromancer Amulet article. Provides unlimited transformations for werewolves. The Ring of Hircine is a Daedric Artifact given to you by Hircine as one potential reward for completing Ill Met By Moonlight. Originally discovered as a cursed ring, you are given the ring by an imprisoned werewolf named Sinding. After acquiring the ring, it will be automatically equipped, not being able to be removed until you complete the quest. As another downside, werewolves will discover that the ring causes them to randomly transform into their beast form. The ring can either be restored or returned to Hircine depending on your actions. If you kill Sinding, you will lose the Ring of Hircine, only to receive Savior's Hide in its place. If you help Sinding kill the hunters pursuing him, you will be rewarded by Hircine by being allowed to keep the ring, with the curse removed. The restored version of the artifact allows werewolves additional transformations into their beast form per day via the Ring of Hircine power accessible from the Powers menu. This does not affect the original Beast Form power, which only grants one transformation per day. For more information, see the Ring of Hircine article. Stamina is increased by 50 points. Feeding on corpses grants you increased Health and Health regeneration for five minutes. 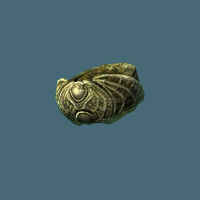 The Ring of Namira is a Daedric Artifact given to you by Namira as a reward for completing The Taste of Death. 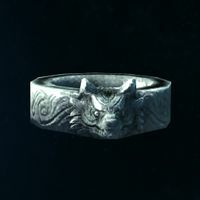 When equipped, the ring grants a Fortify Stamina effect which boosts the bearer's stamina by fifty points. As an added bonus, the ring also grants its wearer the ability to eat the corpses of humanoid enemies which are one of the playable races. If the wearer consumes a corpse, a blessing will grant additional 50 points of health and 50% health regeneration for five minutes, lasting even after the ring is unequipped. This may provoke comments from guards such as "Ugh. Your breath is foul. What've you been eating?" Also feeding off a body, if witnessed, constitutes an assault, and doing so in front of a guard may prompt them to attack you. The Ring of Namira becomes much more useful with Survival ModeCC enabled, as it allows you to easily reduce your hunger by feeding on dead NPCs. For more information, see the Ring of Namira article. 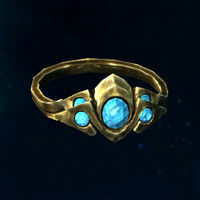 The Savior's Hide is an artifact given to you by Hircine as one of the rewards for the quest Ill Met By Moonlight. It is classified as Light Armor. Its enchantment grants a fifteen percent resist magic effect, as well as a resist poison effect that halves poison damage. It can be improved with leather, and having the Ebony Smithing perk doubles the improvement. For more information, see the Savior's Hide article. 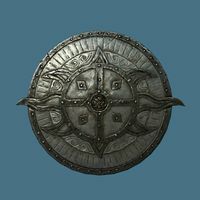 The Shield of Ysgramor is an artifact found in Ysgramor's Tomb, both being named in honor of Ysgramor. Besides its uses as a shield, the artifact also confers its enchantment while equipped. Its enchantment grants the user 20 point Resist Magic and Fortify Health effects. For more information, see the Shield of Ysgramor article. Spellbreaker is one of the most ancient relics of Tamriel. Aside from its historic importance dating from the Battle of Rourken-Shalidor, the Spellbreaker protects its wielder almost completely from any spellcaster. It is said that the Breaker still searches for its original owner, and will not remain the property of any one else for long. For most, possessing Spellbreaker for any time is power enough. The shield creates a Ward when actively blocking that functions identically to any Ward spell found in the school of Restoration. It negates up to 50 points of magical damage, be it inflicted instantly or cumulatively over time (being subjected to a spell like Frostbite or Flames will eventually break the Ward). The Ward is reset every time the shield is raised, and the shield doesn't need to be recharged with Soul Gems. It can be improved with dwarven metal ingots. For more information, see the Spellbreaker article. When bashing, does 3 points of bleeding damage for 5 seconds. 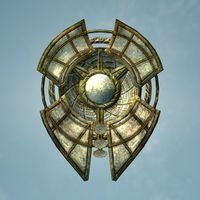 Targe of the Blooded is a unique shield wielded by Umana, a female Redguard who is part of a group of adventurers in the Dwemer ruin of Alftand. 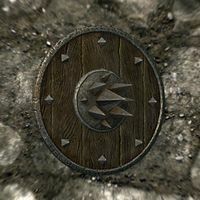 Although the shield has no magical enchantments, it does have large steel spikes that will cause bleeding damage when using the shield to bash opponents. It can be improved with steel ingots. For more information, see the Targe of the Blooded article. 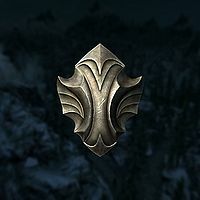 Azura's Star is a Daedric Artifact awarded to you by Azura if you purify her broken star by returning it to Azura's Shrine as part of The Black Star quest. If you return it to Nelacar instead, the reward is the Black Star. The star is a zero weight reusable grand soul gem. Recharging weapons or enchanting objects with Azura's Star merely uses up the soul that it was carrying, not the star itself, unlike what happens to a regular soul gem. The possibility of multiple uses makes the star beneficial for both enchanters and other adventurers. For more information, see the Azura's Star article. 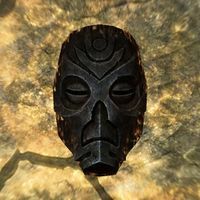 The Black Star is an altered Daedric Artifact awarded to you by Nelacar for cleansing the soul of Malyn Varen from the star as part of the quest The Black Star. It is the alternative award to the original version of the artifact Azura's Star. The main benefit of acquiring The Black Star is the bonus that it offers to enchanters; the star is essentially a reusable black soul gem. Enchanting objects with The Black Star merely uses up the soul that it was carrying, but the star will be able to be reused to store another soul like a regular soul gem. The Black Star also has one clear advantage over Azura's Star: it can capture both black and white souls, unlike Azura's Star, which can only capture white souls. For more information, see The Black Star article. The Oghma Infinium is a Daedric artifact acquired for completing the quest, Discerning the Transmundane. Reading the book will give you the option to boost either your combat, magic, or stealth skills by five levels. For more information, see the Oghma Infinium article. The Skeleton Key is a Daedric artifact acquired after killing Mercer Frey. The Skeleton Key is an unbreakable lockpick, making it rather useful to enterprising thieves. 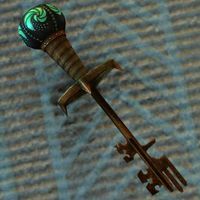 The Skeleton Key also has a secondary, less known function as being used to keep Ebonmere, a well from which luck flows into the world, open. You are tasked with returning the key to Ebonmere in the Twilight Sepulcher to restore luck to the Thieves Guild. Until then, you may retain the key indefinitely for your own use. Despite being a Daedric artifact, the Skeleton Key does not count towards the Oblivion Walker achievement, because it is not acquired through a Daedric quest. For more information, see the Skeleton Key article. The White Phial is a legendary bottle, forged in the days when Skyrim was just starting its turn to ice. A small container, made of the magically infused snow that first fell on the Throat of the World. It is said that the Phial will replenish whatever fluid is placed inside of it. Visiting The White Phial and speaking to Nurelion reveals that The White Phial has been his life's obsession, to the extent that he even named his store after it. Nurelion's research has uncovered the current location of the phial, however he is in the last stages of a fatal illness but believes that The White Phial may be able to save him. 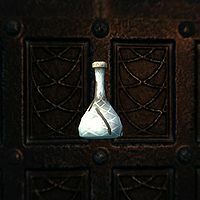 After the quest Repairing the Phial you will be rewarded with The White Phial (Full), which functions as a potion with the effects you choose. Drinking The White Phial (Full) moves it to your Miscellaneous section as The White Phial (Empty). 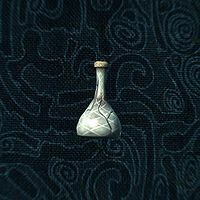 After 24 hours the potion inside the White Phial will regenerate and the potion will be drinkable once again. For more information, see The White Phial article. This page was last modified on 16 April 2018, at 04:54.